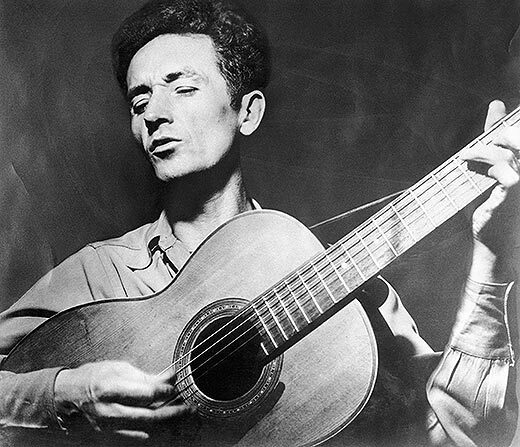 Woodrow Wilson "Woody" Guthrie (July 14, 1912 – October 3, 1967) was an American singer-songwriter and folk musician whose musical legacy includes hundreds of political, traditional and children's songs, ballads and improvised works. He frequently performed with the slogan This Machine Kills Fascists displayed on his guitar. His best-known song is "This Land Is Your Land." Many of his recorded songs are archived in the Library of Congress. Such songwriters as Bob Dylan, Phil Ochs, Bruce Springsteen, John Mellencamp, Pete Seeger, Joe Strummer, Billy Bragg, Jeff Tweedy and Tom Paxton have acknowledged Guthrie as a major influence. 1769 – An expedition led by Gaspar de Portolà establishes a base in California and sets out to find the Port of Monterey (now Monterey, California). 1958 – Iraqi Revolution: in Iraq the monarchy is overthrown by popular forces led by Abdul Karim Kassem, who becomes the nation's new leader.